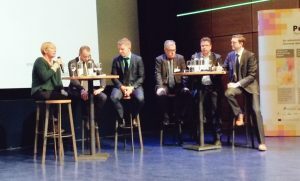 On March 16, more than 80 stakeholders from a vast range of sectors joined the HRE workshop in Amsterdam to discuss scientific evidence based on innovative scenario building and energy system analysis for different decarbonisation pathways in Europe. 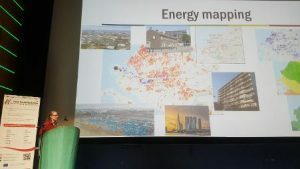 Susana Paardekooper, PhD Fellow at the Sustainable Energy Planning Research Group, Aalborg University, presented all the latest knowledge in HRE and provided a case example of how the project results can be used for the hosting country in her keynote: Hot topics and cool findingd of HRE for Europe and the Netherlands”. Tjalling de Vries from the Dutch Ministry of Economic Affairs welcomed participants in the prestigious NEMO Science museum highlighting the Dutch energy context and the challenge of decarbonising heating in cooling in less than 30 years. Participants and panelists alike stressed the crucial importance of the evidence based data provided by HRE for a more comprehensive approach to transitioning energy systems on all decision-making levels. Brian Vad Mathiesen, HRE Project Coordinator, underlined that HRE cannot do infinite scenarios, but it can democratise the energy debate by giving transparent access to data, assumptions & models. Eva Hoos of DG Energy went as far as to say that she considered Heat Roadmap Europe resources convincing tools to prove to Member states that energy change can happen and that low-carbon opportunities are there. The workshop hosted by the EU Joint Research Centre and co-organised by Aalborg University and ICLEI, further introduced participants to HRE’s main mapping and modelling tools to develop national Heat Roadmaps: Forecast, Cost Curves, JRC-EU-TIMES and EnergyPLAN. Together the tools will allow for building technically possible and socio-economically feasible decarbonisation scenarios. Whereas Forecast (by Fraunhofer ISI) allows for detailed heating and cooling demand profiles, for the residential, industry and service sector, Cost Curves (by Utrecht University) calculate the costs for reducing the heating and cooling demand in buildings and industry in combining information on energy savings and related costs. EnergyPLAN (by Aalborg University) complements this in quantifying the energy, economic, and environmental impact of different energy scenarios by simulating the electricity, heating, cooling, transport sectors on an hourly basis. In combination with the JRC-EU-TIMES (by Joint Research Centre), which is designed to analyse the role of energy technologies and their innovation for meeting Europe’s energy and climate related policy objectives, this will allow for a synergetic, system-wide analysis of the impacts of energy efficiency measures in the heating and cooling sector. Click to see the agenda and presentations.